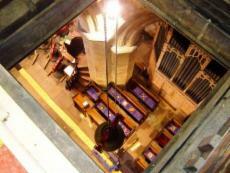 The bells of Ecclesfield Church have been ringing for over 400 years. In these days of mobile phones and the Internet, Church bells are still the only way of conveying a message to the people of Ecclesfield all at the same time. That message is that St Mary's is open to everyone and we are here to help people love and worship God. 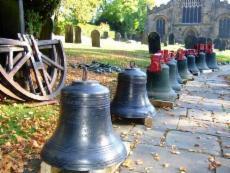 Bells proclaim services, weddings, special occasions and celebrations. 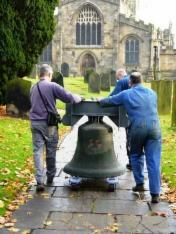 To keep the bell ringing tradition alive for the future in 2008 we needed to raise £60,000 to do essential maintenance to the bells, their fittings and to add two new bells. This fund raising became know as The Ecclesfield Peal Appeal. We are pleased to announce that in 2011 we reached our target. 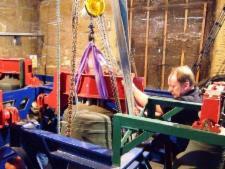 On Monday 26th September 2011 work started to remove the 8 bells from the tower. 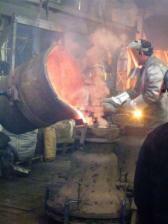 Whitechapel Bell Foundry retuned 5 of them, recast 2 and cast 2 new bells. 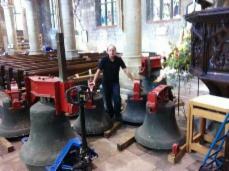 On Thursday 1st December 2011 the bells rang out again. 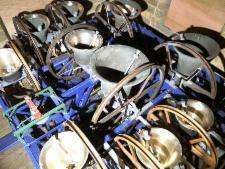 Transformed, improved in tone and handling and now including 2 new bells the 10 bells of St Mary's are as we predicted 'magical to hear'. 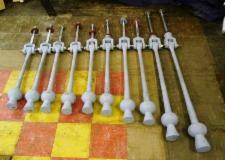 We would particularly like to thank our benefactor who kindly offered to pay for the 2 new bells. We would also like to thank all individuals, charities and other organisations who have contributed to our appeal. 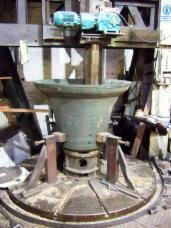 Thanks also to the Sheffield Branch of the Yorkshire Association of Change Ringers who funded the cost of recasting one of the orginal bells. Safe and sound down on the floor. Next job outside and up the path. Waiting for the lorry to go to London. Photo opportunity. Returned and being wheeled back into church. 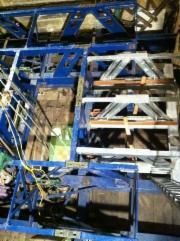 New steel frame installed to take the extra bells. Silver new frame, blue original frame. All back and ready to ring.